So reads the dedication of William Peter Blatty's Finding Peter, a deeply moving memoir that tests the bounds of grief, love, and the soul. Blatty, the bestselling author and Oscar Awardwinning screenwriter of The Exorcist, lived a charmed life among the elite stars of Hollywood. His son Peter, born over a decade after The Exorcist, grew from an apple-cheeked boy into an "imposing young man with a quick, warm smile." But when Peter died very suddenly from a rare disorder, Blatty's world turned upside down. As he and his wife struggled through their unrelenting grief, a series of strange and supernatural events began occurringand Blatty became convinced that Peter was sending messages from the afterlife. 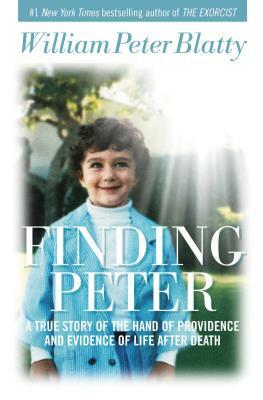 A true and unabashedly personal story, Finding Peter will shake the most cynical of readersand it will remind those in grief that our loved ones do truly live on. William Peter Blatty is the bestselling author of The Exorcist, which he turned into an Academy Award–winning screenplay. The son of immigrant parents, he was a comic novelist before embarking on a four decade career as a Hollywood writer, penning the screenplays for A Shot in the Dark, What Did You Do in the War, Daddy?, the Julie Andrews romantic comedy Darling Lili, and The Ninth Configuration (which he also directed), among many other films. A graduate of Georgetown University, he lives with his wife, Julie, in Bethesda, Maryland.